Processing cassava provides a lot of employment and adds value especially for women and youth. The CGIAR Research Program on Root and Tuber Crops (RTB) has a dedicated cluster on this in its new program structure. 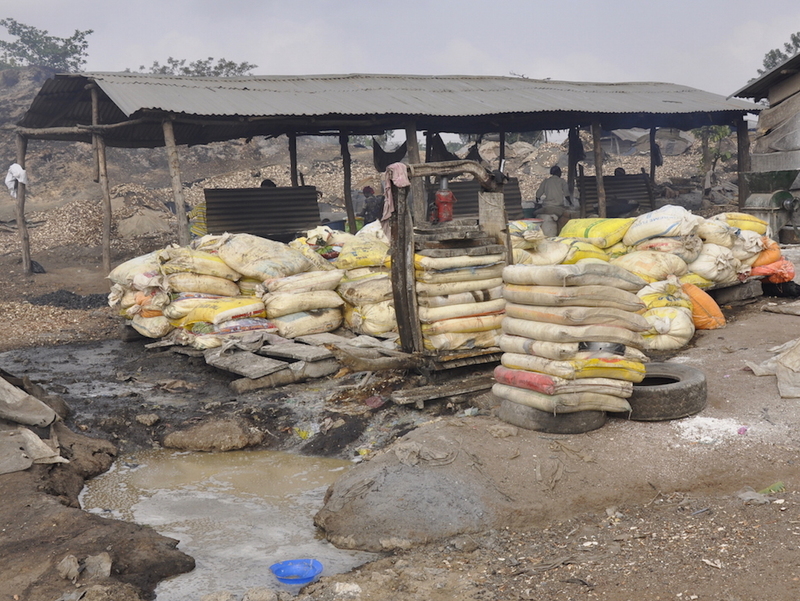 In May 2015 Graham Thiele, the Director of the RTB, together with CIAT, IITA and CIRAD post-harvest experts Dominique Dufour, Adebayo Abass, Bamidele Alenkhe and Thierry Tran, visited the Ajegunle processing site in Oyo town, in order to learn about the existing processes and to identify opportunities for improving small scale gari processing. Oyo state is the second largest cassava producer in Nigeria after Edo. The Ajegunle processing site receives 50 pick-ups of cassava per day, which are unloaded and peeled by female workers with long knifes. Each woman has a separate mound and puts the peeled cassava in a basket. The preferred cassava variety at the processing site is Arubi elu. One of its main reasons is that it can be kept many days after harvesting without browning, an advantage for producing white gari. Here, the Arubi elu variety which – after three days – shows no streaks symptomatic of post harvest physiological deterioration. The peeled cassava is taken to a motorized grater, which takes around 45-60 minutes to grate 1.2 tonnes. After grating there are about 60-63 bags, from one load of 1.2 tonnes. The grated cassava is kept for 3 days in fermentation bags, in order to become more acidic and lose water, which makes it easier to press. The next step is pressing the fermented cassava, which takes about 2 hours. A press can take up to 8-10 bags, so pressing the whole initial load of 1.2 tonnes of roots takes about 12-14 hours. Of the initial 1.2 tonnes, approximately 1 tonne remains after peeling and about 500 kg after pressing. The run off of water from fermentation and pressing represents an environmental hazard, as it contains starch and cyanide. Due to the run off, bananas cultivated at the back of the processing center do not fruit well. 20 years ago another processing center produced so much contamination that inhabitants couldn’t drink the water from their wells, so they requested the center to be closed. After pressing, the flattened bags are taken to a mechanical granulator. The grating process is uneven and large pieces are left after milling. Besides, the granulation and most of the wet operations are done with little hygienic standards. In the next production step, the cassava grits are sieved and then taken to the open pan gari fryers, where women fry the gari moving it constantly to avoid it from burning. Here, Mrs. Adekunle Ajara fries gari with IITA post-harvest expert Abass Adebayo. Open pan gari friers use a lot of firewood and produce a smoky unhealthy environment. After frying, the gari is sieved and the larger particles are sent back to the granulator and fryer steps. Final rejects and peels are sun dried and sold as animal feed. Old and young women are involved in the gari processing on the processing side, providing jobs to about 1200 people. About 90% of those employed and also many of the 90 business owners are women. When asked why no men were involved in more operations, Mr. Adebayo explained that the traditional cassava processing norm is that women are mostly engaged in peeling and frying while men do more power-intensive jobs such as pressing. Here, Dominique Dufour, post harvest expert at CIRAD/CIAT, is chatting with some of the many women at the center. Since the establishment of the gari processing industry in Ajegunle, Oyo in the 1990s, there have been major improvements, e.g. in sieves and frying pans, the jacking for pressing and the mechanization of grating. Mr. Adebayo mentions that he would also like to see a fully mechanized process to reduce drudgery. Mr. Adedokum strongly disagrees, pointing out that this would put the jobs of 1,000 people at risk. Only on probing, there could be changes as long as they preserve employment. All these changes should ensure that jobs are preserved, making sure that technologies are family-friendly and provide a conducive environment for women and their children of pre-school age. This entry was posted in News and tagged Africa, cassava, Nigeria on Aug 19, 2015 by .